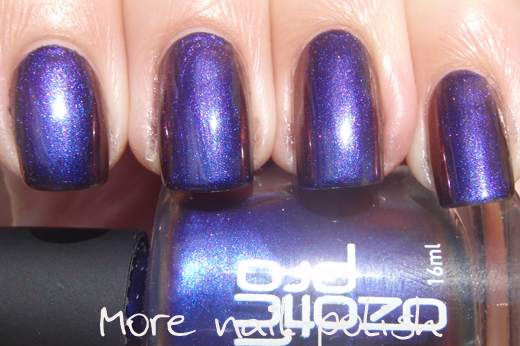 Continuing my Ozotic multi chrome theme this week, here is #504 Twilight. Twilight has quite a bright blue base, shifting through golden orangey tones to red. Now my photos make this look rather purple, which isn't incorrect. Because, if we talk basic 101 colour mixing, blue mixed with red makes purple. 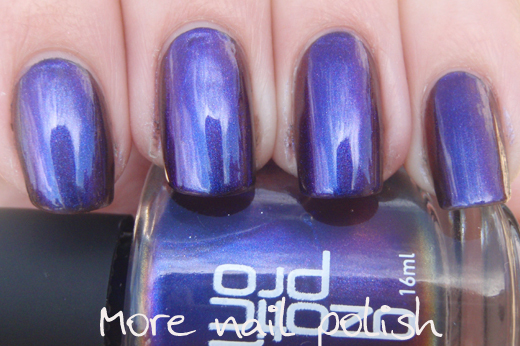 Because this polish shifts from blue to red, you get to see all variations of purple in between. That's what I love about multi chrome polishes. These polishes also look totally different in the sun compared to indoors or in the shade. Indoors you can really see a smooth colour shift, almost like you have a base colour on, and then there is a layer of different coloured jelly on top. In the sun the metallic sparkles bring a whole new dimension. 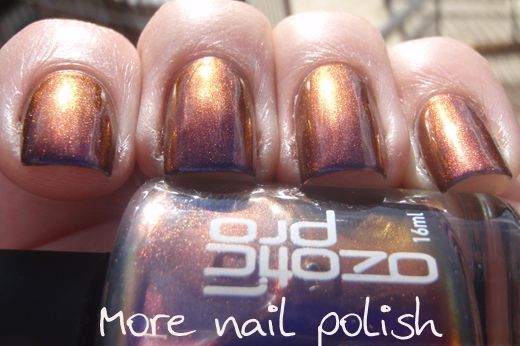 I totally love this polish because it has amazing multi chrome shifts. 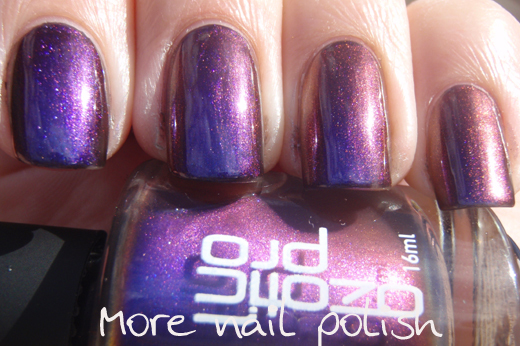 But, I would list this polish somewhere in the middle of my favourite multi chromes. The only reason for that is because it shifts to red and I personally prefer cooler colours on my nails. For reference, this was two coats over a black base. Very nice. I have 506 but I think I would have preferred this one. Our site, NaildeRoyale.com, has the same passion of promoting beauty and sharing the essence of having high quality products. Please let me know if sharing our link on your blog spot interests you. I'd be glad to mail you nail art products. Definitely on my want list! I recently purchased 505 and 506. I can see now I'm going to have to back for the 504 as well.